Fordingbridge Camera Club: Why use Adobe RGB? There is a perceived wisdom that Adobe RGB is for prints, this explores that idea. If images are to be printed and there is a desire to ensure that the printer is used to its maximum capability then the working space chosen for processing should encompass the gamut of the printer and paper combination. In my case I use an Epson 3800 and Premium Semigloss Photo Paper (PSPP). The perceived wisdom has been to use Adobe RGB for printing but the following shows that the 3800 and PSPP exceed the gamut offered in the Adobe RGB working space. This is the 3D plot where the wire frame is Adobe RGB and the solid is the PSPP shown in Lab. Where you cannot see the wireframe it means that the gamut of the printer/paper exceeds that of Adobe RGB. This is a 2D plot at L=50 showing the two borders of the gamuts. 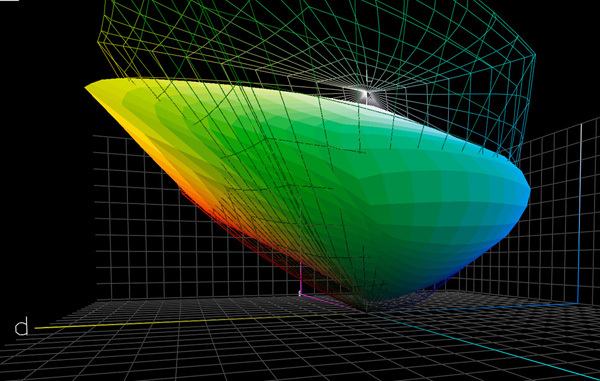 At L=50 it can be seen that although Adobe RGB is bigger it does not encompass the entire PSPP gamut. The green/cycan on the left is outside Adobe RGB. I have produced a small animation of a slice through the gamuts as L varies from 0 to 100. And you can see the relative positions of the two gamuts change. You can watch on YouTube HERE. I have also prepared a 3D animation HERE. 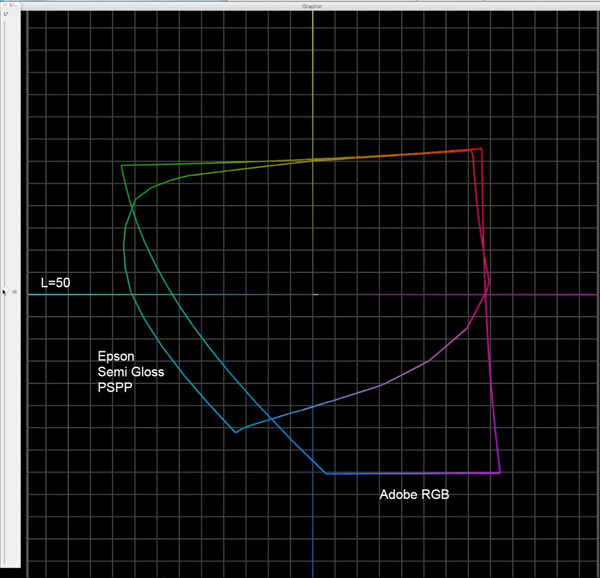 It shows that although Adobe RGB is ‘bigger’ than the gamut of the printer/paper it does not encompass it. Therefore some colours that the printer paper can reproduce are not contained within Adobe RGB. So if you wish to exploit the full gamut of your printer, if you have an Epson 3800 and PSPP paper :-), then your PS working space should be 16 bit Prophoto as that does fully encompass the printer gamut. It should be noted that Lightroom uses Melissa as its working space which is a derivative of Prophoto. There is an additional paper from Dr Tony Kaye HERE.